Police parade vigilante group leader and his members that that kill their victims and sell their organs in Kogi - SWANKYLOADED OFFICIAL BLOG. 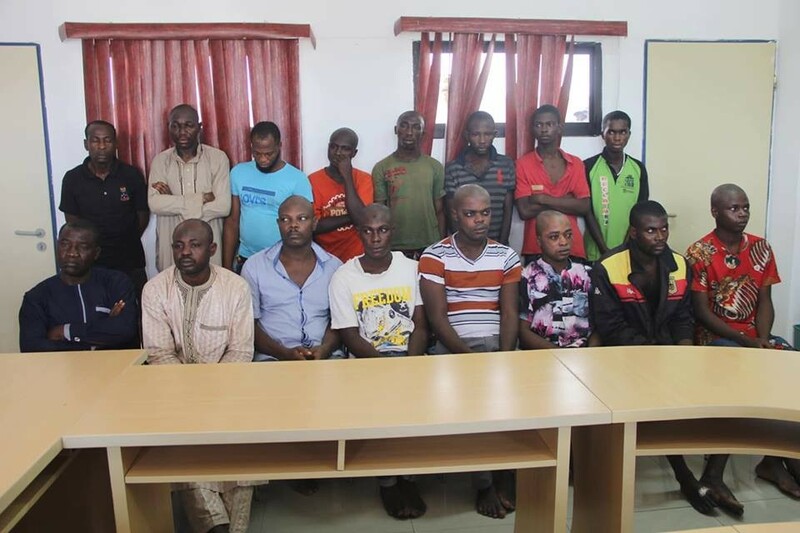 The Nigeria Police Force today paraded a 16-man kidnapping syndicate that specialize in killing their victims and selling off their vital body organs to buyers in Kogi state and other neighboring states. 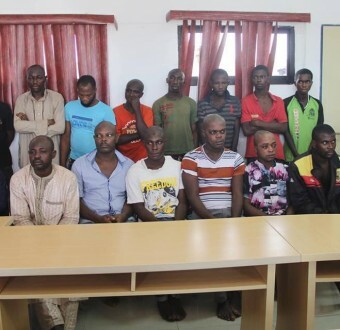 Parading the suspects before newsmen in Abuja today, the spokesperson of the Nigeria Police Force, Jimoh Moshood, said the police began investigation into the group's activities following repeatedly cases of abduction, killing and removal of vital body parts of victims were reported in Ankpa town and environs as well as the killing of a Police Inspector, Abdul Alfa, at Ejule Police outpost in Ofu LGA while on foot patrol on the 28th November, 2017. According to Jimoh, the Inspector General of Police Strike Force attached to Operation Absolute Sanity, began investigating all these cases and it was discovered from information and intelligence gathered from public spirited individuals and residents, that a gang was responsible for kidnapping, gruesome murder, and ritual killings of innocent people in Kogi State, travellers passing through Kogi State and strangers coming into towns in the area. Hamidu admitted that they were sponsored and working for one Abdulahi Ibrahim Ali a.k.a (Halims) and ALHAJI Shaibu Adamu a.k.a AYE-MARINA whom they handover the body parts to after killing their victims and severing their body organs and collecting huge sums of money in hundred thousands of Naira. Aye-Marina’s driver known as Zakaru receives the body parts from Yakubu Hamidu. According to Jimoh, one of the buyers of the human parts, Abdulahi Ibrahim Ali a.k.a (Halims), used the proceed of crime to build and own so many properties including big hotels and several filling stations in Kogi State while his other partner, Shaibu Adamu a.k.a MARINA without known profession or any known means of livelihoo, is suspected also to have built and own mansions and four (4) filling stations in Ankpa, Kogi State and another four (4) at Onyangede in Benue State with the proceeds of the crime. Jimoh said investigation is being concluded and efforts being intensified to arrest other suspects who include prominent personalities linked to the crime but still at large.